Medicine Black-on-red seed bowl. Click the image to open the Medicine Black-on-red gallery. Medicine Black-on-red is a Tsegi Orange Ware type common in northern Arizona. Date Range: Kayenta Heartland: A.D. 1040-1170 (Christenson 1994), Flagstaff Region: A.D. 1065-1125 (per Christian Downum, Northern Arizona University). Core Color: Black to gray, dark brown (rare) to brick red. Surface Finish: Bowls sometimes bumpy; polished, horizontal polishing marks conspicuous around vessel; both surfaces bowls, exterior surface jar forms slipped; slip generally thick with temper extruding; slip flakes off large areas of heavily weathered sherds leaving core mottled yellow with temper; generally coarsely crazed. 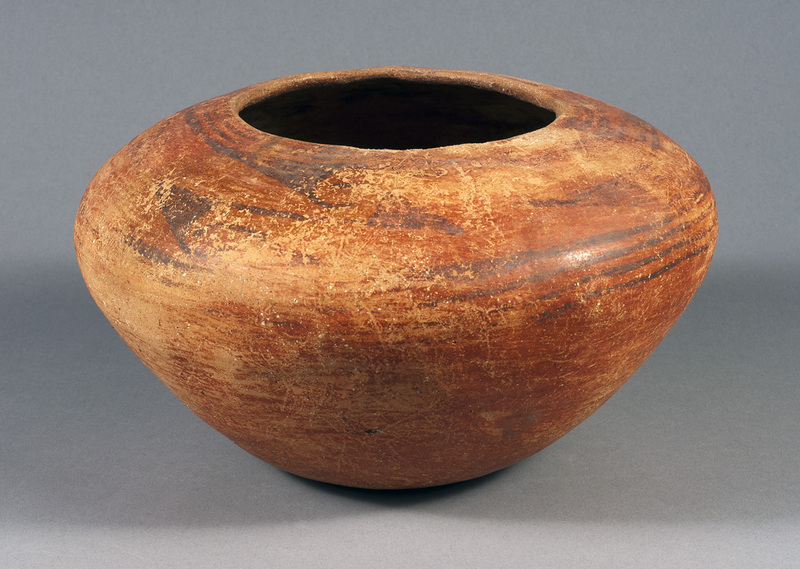 Surface Color: Red; interior jar forms tan; color surface and core contrast. Vessel Thickness: 3.7 to 5.0 mm; average about 4.5 mm (jar walls). 2.7 to 6.3 mm; average 4.5 mm (bowl walls). Paint: Black, generally dull, flat, rarely metallic sheen, frequently reflects light; sometimes flakes off. Design: Confined to interior surface bowls; exterior surface jars. Geometric; generally pendant from rim; rim sometimes decorated in part. Narrow lines (uncommon), solid areas, broad lines, stripes, triangles. Comparisons: Tusayan Black-on-Red has mostly narrow or wide horizontal or diagonal hachures in rectangular or curved panels; never solid elements, often one to four horizontal lines below rim. Christenson, Andrew. (1994) A Test of Mean Ceramic Dating Using Well-Dated Kayenta-Anasazi Sites. Kiva 59(3). April Peters, Northern Arizona University Anthropology Laboratories.